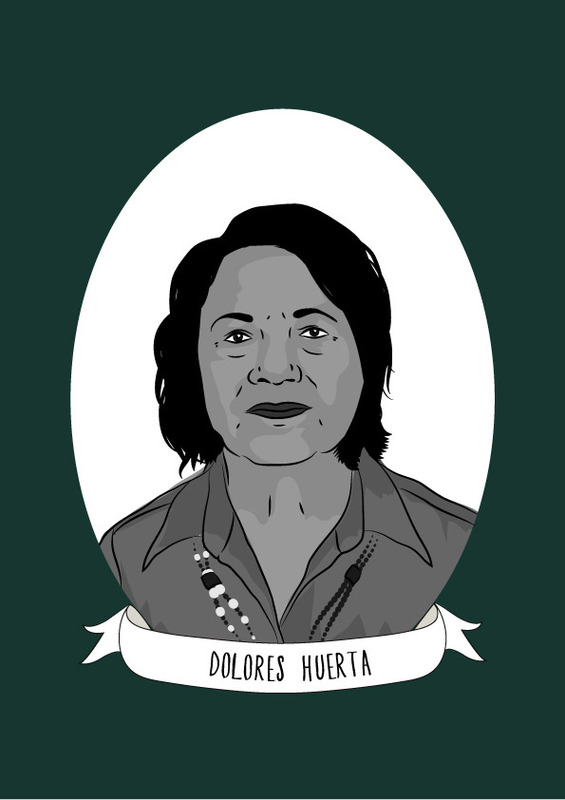 Dolores Huerta is a labor leader and civil rights activist who co-founded the National Farmworkers Association – later the United Farm Workers (UFW). Huerta’s career in life was inspired by both of her parents, mother’s independence and entrepreneurial spirit was one of the primary reasons she became a feminist. Although her parents divorced, she was fiercely proud of her father’s journey from coal miner to migrant labourer to union activist to an elected representative in the New Mexico state legislature to college graduate. As a high school student, Heurta follower her mother into community organising (her mother was active in the community and ran a 70 room hotel where she often, waived the fee for low-paid workers.) After graduating, she defied the norm of her era by continuing her education at the University of Pacific’s Delta College. After a series of unsatisfying jobs, Heurta earned a teaching qualification and it was while teaching that she realised that she could no longer stand by while her students came from homes that were unable to eat or clothe their children due to the low-wages and conditions of poverty migrant farmworkers were forced to endure. She joined the Stockton Community Service Organisation (CSO) where she lobbied California state legislators to enact progressive legislation as old-age pensions for non-citizens. During this time, she also founded the Agricultural Workers Association which set up voter registration drives and pressed local governments for barrio improvements. Heurta and colleague César E. Chávez decided to focus their attentions on organising farm workers, and as this was against the ideas of the CSO they left to found the National Farm Workers Association together. Heurta’s skill in lobbying and negotiating led to the organisation securing Aid For Dependent Families (“AFDC”) and disability insurance for farm workers in the State of California in 1963. Heurta also organised the grape boycott in the late 1960s forced grape producers to improve working conditions for migrant farmworkers and co-ordinated nationwide lettuce, grape, and Gallo wine boycotts in the 1970s which led to the enactment of the Agricultural Labor Relations Act of 1975, which granted farm workers in California the right to collectively organise and bargain for better wages and working conditions. From 1988 to 1993, Huerta served on the U.S. Commission on Agricultural Workers. She has also worked tirelessly for women’s rights, and campaigned for two years on behalf of the successful Feminist Majority’s Feminization of Power: 50/50 by the year 2000 Campaign encouraging Latina’s to run for office. In 2002 she founded the Dolores Huerta Foundation, which was involved in community organising and she continues to work tirelessly developing leaders and advocating for the working poor, women, and children. She has been recognised for her pioneering activism by a number of organisations and was the first Latina inducted into the National Women’s Hall of Fame.